Dr. J. Norman Young, President and Chairman of the Board ! Most of us in the know view him as the Father of Palm Coast ! Dr. Norman Young, President and Chariman of the Board of ITT Community Development Corporation, was one of four guests discussing various aspects of economics and investments against a backdrop of spiraling inflation in America today. The other guests included Harry Browne, prominent author of "You can Profit from a Monetary Crisis' and a vociferous advocate of gold investment, Robert Lyler, President of the U. S. Bullion Corporation, a company that buys and sells silver, which Mr. Lyler believes is a good investment as a hedge against the inflationary aspects of the American dollar, and Art Linkletter, well- known television personality. The staunch confidence Dr. Young maintains in the future of America, stems from the fact that early in professional life he developed an expertise in statistics and learned that they have a pecular characteristic....they're never level, never always up , never always down. They fluctuate and so there will always be ups and downs associated with the valuation of the dollar, of gold , of silver,. As far as the economy goes, there is absolutely no certainty of anything approaching the "funereal predictions of so many doomsayers." In another line of discussion, Dr. Young assayed the plight and decay of many major American cities. Cited as a root cause, restrictive non-planning was contrasted with enlightened design inherent in the use of master plans. Dr. Young also stressed the increasing awareness of the psychological effects of crowding and pollution, prevention of which are prime concerns in the development of new communities. 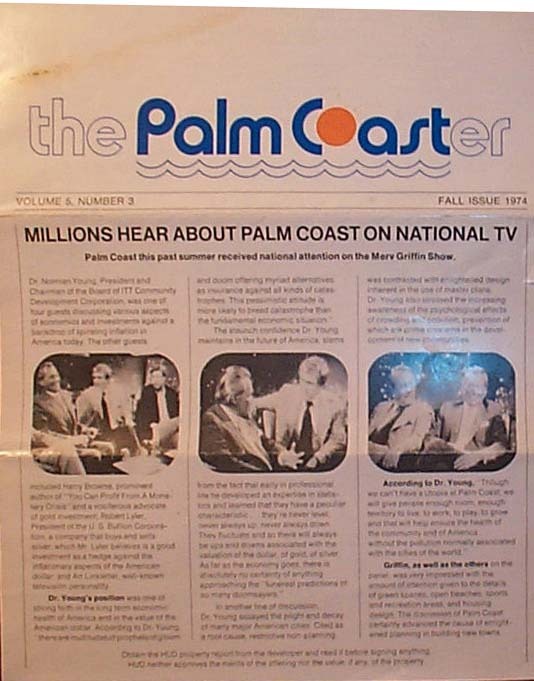 According to Dr. Young, "though we can't have a Utopia at Palm Coast, we will give people enough room enought territory to live, to work , to play , to grow and that will help ensure the health of the community and of America without the pollution normally associated with the cities of the world." Griffin, as well as the others on the panel, was very impressed with the amount of attention given to the details of green spaces, open beaches, sports, and recreation areas, and housing design. The discussion of Palm Coast certainly advanced the cause of enlightened planning in building new towns.